Cutufia's Tip for the Road: Always look for points in common. A Buenos Aires cab driver for the past 25 of his 62 years, Cutufia isn’t much of a tippler. Every once in a while he’ll indulge in a Quilmes, Argentina’s national beer, the taste of which resembles diluted Pabst Blue Ribbon. But he works during normal drinking hours and needs all of his wits to brave the inferno that is porteño traffic. So instead of patronizing a parrilla or bar, we meet for a leisurely tour of the city’s riverside neighborhoods in Cutufia’s black-and-yellow Chevrolet Corsa Classic. Extraordinary circumstances have brought us together. 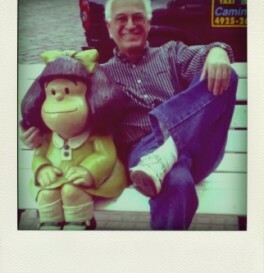 Cutufia and I met on one of my first nights in Buenos Aires last fall, when I flagged him down outside my apartment. I’d been warned not to hail taxis on the street–that calling radio cars was much safer, that as a small, blonde gringa I had to take extra precautions–but with his avuncular smile, wire-rimmed glasses, and tonsured white hair, Rodolfo looked more monkish than thuggish. As we bumped over the cobblestoned streets of Palermo Hollywood, an up-and-coming neighborhood of trendy bars and steakhouses, Rodolfo regaled me with stories of former passengers–Chinese ambassadors, French singers, Argentine cartoonists. He liked to document each trip, he explained, by having his riders sign a guest book, or “agenda” as he called them, with a note, their occupation, and their contact information. Argentina, a country obsessed with its fading fortunes, is known for having legions of underemployed professionals, many of them driving cabs in Buenos Aires. Before Cutufia took to the wheel as a taxista, he had worked at an electricity business, teaching seminars to help the company’s senior citizens transition into retirement. Eventually, he hopes to build a charitable foundation that can leverage the contacts in the 60-plus agendas he has compiled. As we pulled up to the curb that first time, Cutufia handed me a faux-leather agenda and piled my lap with eight laminated articles that had been written about him and his project by local press. He invited me to sign, offered me a wrapped cherry-flavored hard candy, and wished me luck as I departed into the night. Three months later, after seeing The Adventures of Tintin in one of the city’s gaudy new shopping malls, I reached my hand out for a cab once again. Deep in conversation about Spielberg’s take on the Hergé classic, my friend and I failed to notice our driver’s face as we slid into the taxi’s back seat. But, sure enough, as we pulled up to our destination and fished into our wallets to pay, the taxista offered us wrapped caramels and asked if we wouldn’t mind signing his guest book. Stunned, I flicked through the guest book to show Cutufia where I had signed back in October: “Haley Cohen. Estudiante.” “That’s me!” I told him excitedly in Spanish. Miraculous, perhaps, but also fitting. Cutufia’s entire life philosophy centers on human connectedness. On an immediate level, he takes great pains to brighten the mood of each passenger who enters his taxi. “Even if they don’t speak Spanish, I try to engage in little ways–offering a piece of candy, picking out music I think will suit them, wishing them a happy holiday if it’s Mother’s Day, or Student’s day, or Lawyer’s Day, and, most importantly, just smiling,” he says. Beyond personal interaction, Cutufia hopes to link his contacts to one another in order to facilitate social change. Others would tell him they were most concerned about the environment and to call him if he wanted to connect on that issue. A taxista is an improbable clearinghouse for philanthropy, but his eagerness to connect social dots led to his vision for Estrechando Manos (which translates to “Helping” or “Reaching” Hands). As he had explained to me on our first ride, his aim for such a foundation is to harness the knowledge, tools, and contacts of his passengers, and eventually direct them toward his social ventures in Argentina. Several passengers have already helped Cutufia get started by designing his website free of charge. But until the economy improves and he can find permanent legal counsel, Cutufia’s foundation will remain mostly the shell of a dream. Cutufia shows me some of his prized mementos, starting with the dog-eared agenda. There’s also a manila package sent by a passenger from Berlin, a poem an Argentine passenger wrote him for “Friend’s Day,” and a laminated certificate signed by Pope Benedict XVI granting Apostolic Benediction to “Rodolfo Alberto Cutufia and Family.” There are business cards from Chilean Google employees, Congolese political figures, and Spanish PR executives, photos of a Rotary Club Award reception honoring Rodolfo, and several cursory sketches by Argentine cartoonists drawn onto lined agenda pages. Haley Cohen, a New Yorker, graduated from Yale University in 2011 and is spending a year in Argentina researching that nation’s media regulations.